Wider in size, these Large Volume Alleviators are supplied in the market after complete inspection on numerous parameters. Easy to use and clean, this alleviator is made very precisely under the guidance of professionals and with the use of quality checked material. Being committed towards attaining maximum client satisfaction, we are providing to them a broad array of EN31 Big Diameter Pipes. Our gamut of stainless steel welded pipes of large diameter stands high in terms of quality as they are produced as per ASTM A – 358. These pipes are sized and straightened, using 150M.T. capacity Hydraulic press to meet ovality and dimensional requirements. 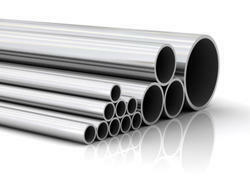 These pipes are also passed through chemical, physical and hydrostatic testing so as to ensure high quality. - Lesser coil choking ensuring longer life of the coil. - Also the coil of BABA-THERM product is machine wound which avoids the flame giving any temperature hot spots within the chamber.